MSMEs in India consumed USD 1.5 Bn worth of digital services in CY18- not a small market by any means. 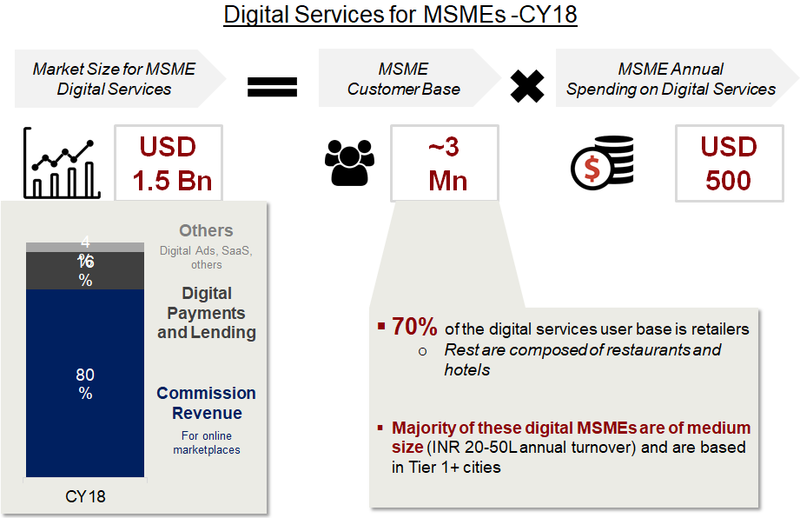 Yet, a closer look reveals that the consumption structure of digital services amongst SMEs is highly skewed- only 3 Mn or 6% of all MSMEs embraced paid digital services in any form, and 80% of the MSME digital services market was composed of commission revenues. While other services like digital advertising, logistics etc. are a very small chunk of the market. 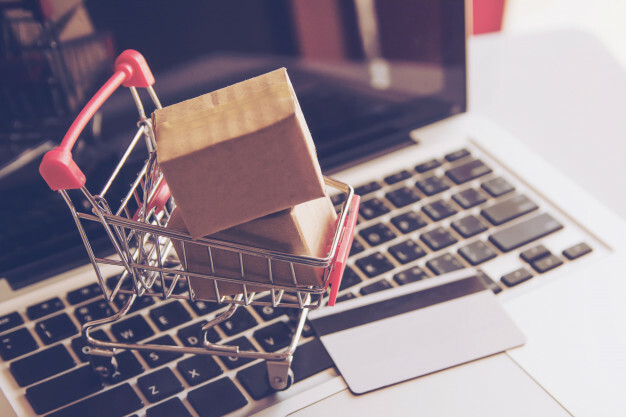 Online Marketplaces have been instrumental in MSME digitization, by opening a wide customer base which never existed for MSMEs, supported with deep insights around the products, demand, planning and pricing. Starting from this initial hook for MSMEs, over time these platforms have themselves become more mature and are offering an ever-wider bouquet of services for their MSME partners (see below chart). These platforms put MSMEs deeper into an ecosystem that offers digital payments, lending, advertisements, logistics and so on. MSMEs can then selectively adopt various business services over time as the marketplace matures and MSMEs feel a greater need to invest on these services in order to stay relevant and to continue serving their consumers effectively. 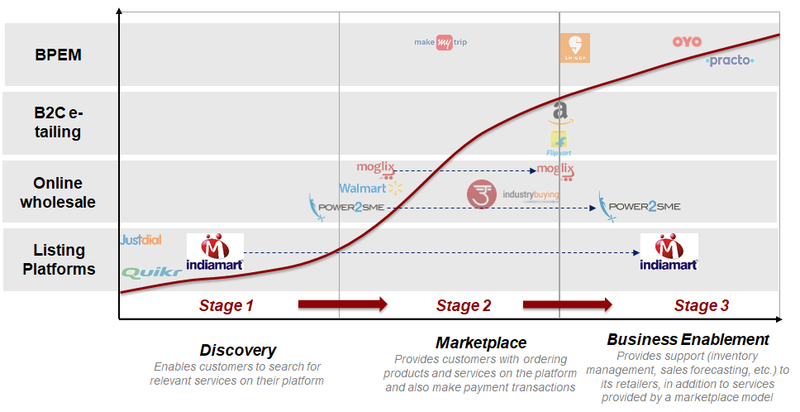 We are very bullish on the opportunity ahead in digitization. We expect rapid growth in the funnel itself (higher % of sellers paying for digital services) as more MSMEs come online to these platforms. Additionally, we expect MSMEs to adopt a wider bouquet of services with platforms pushing them to adopt them in future. Our research with MSME validated that those who have adopted digital services (primarily for additional revenue growth) show a strong benefit and optimism from their digital journey and are willing to adopt other digital services in the future especially advertising and enterprise software. 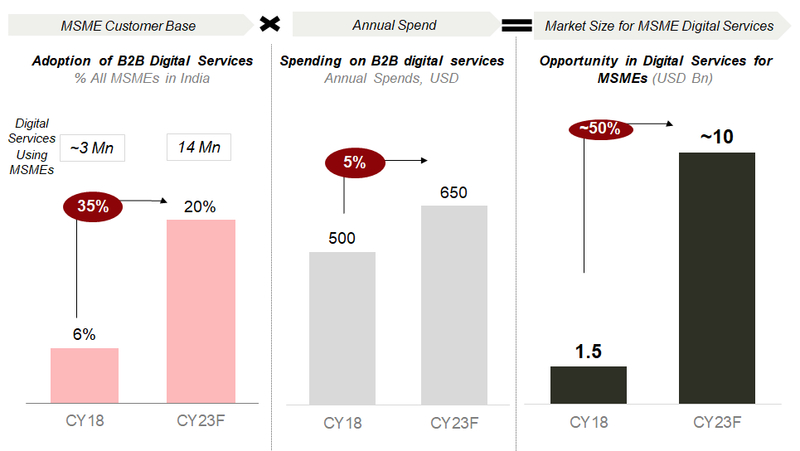 Driven by this greater adoption (wider) and increased spending (deeper), we expect that the B2B digital services market for SMEs will increase to USD 10 Bn from the current USD 1.5 Bn over the next five years at a CAGR of 50%. Redseer-IAMAI joint report on the ‘Digital Services landscape and its impact on the MSMEs’ was launched on Jan 18th 2019. The report includes a comprehensive coverage of all major B2B service sectors and the associated opportunities and challenges. Please reach out to us to know more. Thanks for subscribing to RedSeer Insights..
Browse fresh content daily on investment funds, internet, consumer goods, healthcare, education, agriculture and automotive. You are signing up to get email notifications on our latest content from across the industries and functional practices. © 2019 RedSeer Management Consulting Pvt. Ltd. All rights reserved.